The missionary we work with says it takes about $450 a month to feed the 100 kids at one feeding center 3 days a week. We and other churches have helped do this, but for every 100 kids fed there are thousands that go hungry each day. Could the American church feed all hungry children in world? Thanks to the research organization The Empty Tomb (www.emptytomb.org) we now know the answer to this question! If Americans who identify with the historically Christian church had chosen to give 10% to their congregations rather than the 2.43% given per year, there would have been an additional $172 billion available for work through the church.1 If those members had specified that 60% of their increased giving were to be given to international missions, there would have been an additional $103 billion available for the international work of the church. That would have left an additional $34 billion for domestic missions, including poverty conditions in the U.S.,2 and this all on top of our current church activities! This information should encourage us. Progress is possible! It is within the church’s ability in America to end child deaths worldwide, educate all children worldwide, help the poor worldwide and evangelize the world! We have this capability! Could we feed all the hungry children in the world? YES, if everyone gave 10% like you do. Thanks for doing your part to make a difference! 1 The basis for the calculations of potential giving by historically Christian churches in the U.S. in 2008 is as follows. In chapter seven of this volume titled Why and How Much Do Americans Give? a 2008 figure of total giving to religion was presented in the Denomination-Based series Keyed to 1974 Filer Estimate. That figure was $74.9 billion. A figure of 73.8% was multiplied by the 2008 figure for giving to religion of $74.9 billion to determine what amount was given by those who identify with the historically Christian church. The result was $55.3 billion. In 2008, if giving had increased to an average of 10% from the actual level of 2.43% given, instead of $55.3 billion, an amount of $228 billion would have been donated to historically Christian churches. 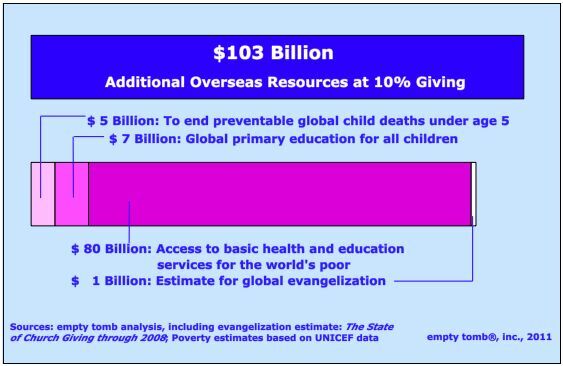 The difference between the $55.3 billion given and the potential of $228 billion is $172 billion, the additional money that would have been available at an average of 10% giving. The above figure of 73.8% was based on an empty tomb, inc. analysis of data published in Barry A. Kosmin and Ariela Keysar; American Religious Identification Survey [ARIS 2008] Summary Report; Hartford, Conn.: Trinity College, March 2009; p. 5 of 7/4/2009 printout, and referred to that portion of the U.S. population that identifies with the historically Christian church—those communions and traditions, such as Roman Catholic, Orthodox, evangelical and mainline Protestant, Pentecostal, and Anabaptist, that profess a commitment to the historic tenets of the faith. See John and Sylvia Ronsvalle, The State of Church Giving through 2008: Kudos to Wycliffe Bible Translators and World Vision for Global At-Scale Goals, But Will Denominations Resist Jesus Christ And Not Spend $1 to $26 Per Member to Reach The Unreached When Jesus Says, You Feed Them ? (Champaign, IL: empty tomb, inc., 2010), Chapter 6, p. 65. 2 It may be noted that the estimate of an additional $172 billion that would be available if average giving were at 10% is at the lower end. Rather than using the calculation detailed in the previous endnote, two other estimates of $587 billion and $742 billion for 2008 were obtained based on alternate assumptions. An alternative estimate of $587 billion was derived based on the assumption that: (1) 59.45% of Americans are members of historically Christian churches, with aggregate after-tax income of $6.4 trillion; (2) religious giving was $74.9 billion in 2008; and (3) 73.8% of religious giving was from self-identifying Christians (estimate based on ARIS 2008). The results indicated that the giving level among self-identifying Christians was 0.86% of historically Christian church member after-tax income in 2008, rather than the 2.43% noted in the previous endnote. In that case, the difference between 2008 giving at 0.86% and 10% would have been $587 billion. Alternatively, one could base the potential giving level calculation on the assumptions that: (1) 73.8% of Americans identify with the historically Christian church, whether or not they are members (estimate based on ARIS 2008); (2) this portion of Americans had an aggregate after-tax income of $8.0 trillion; and (3) the calculation considered contributions as possibly available from this 73.8% of U.S. population. Giving levels would then have been at the 0.69% of income level. In that case, the difference between self-identified Christian giving in 2008 at the 0.69% level and a potential 10% level would have yielded an additional $742 billion in 2008. The estimate of 59.45% church member figure was an empty tomb, inc. calculation based on Gallup, Religion in America 2002, pp. 28, 40. The 2008 aggregate Disposable Personal Income figure of $10.8064 trillion that was multiplied by the church member population figures in the two alternative calculations contained in this endnote above was obtained from U.S. Bureau of Economic Analysis National Income and Product Accounts, Table 2.1, Personal Income and Its Disposition, line 26, data published 3/26/2010. For further discussion, see Chapter 6, The State of Church Giving through 2008, including p. 65. 3Carol Bellamy, The State of the World’s Children 2000 (New York: UNICEF, 2000), p. 37. 4James Grant, The State of the World’s Children 1990 (New York: Oxford University Press, 1990), p. 16, estimated that $2.5 billion a year would be needed by the late 1990s to stop preventable child deaths. An updated figure of $5.1 billion was cited in Jennifer Bryce, et al. ; Can the World Afford to Save the Lives of 6 Million Children Each Year? ; The Lancet, vol. 365; 6/25/2005; p. 2193; <http://www.thelancet.com/journals/lancet/article/PIIS014065667773/fulltext>; p. 1 of 1/11/2006 printout. 5United Nations Children’s Fund (UNICEF), The State of the World’s Children, Special Edition, Statistical Tables (New York: UNICEF, November 2009), p. 11. 6Carol Bellamy, The State of the World’s Children 1999 (New York: UNICEF, 1999), p. 85. 7 John Ronsvalle and Sylvia Ronsvalle, The State of Church Giving through 2005: Abolition of the Institutional Enslavement of Overseas Missions (Champaign, IL: empty tomb, inc., 2008), pp. 66-67. 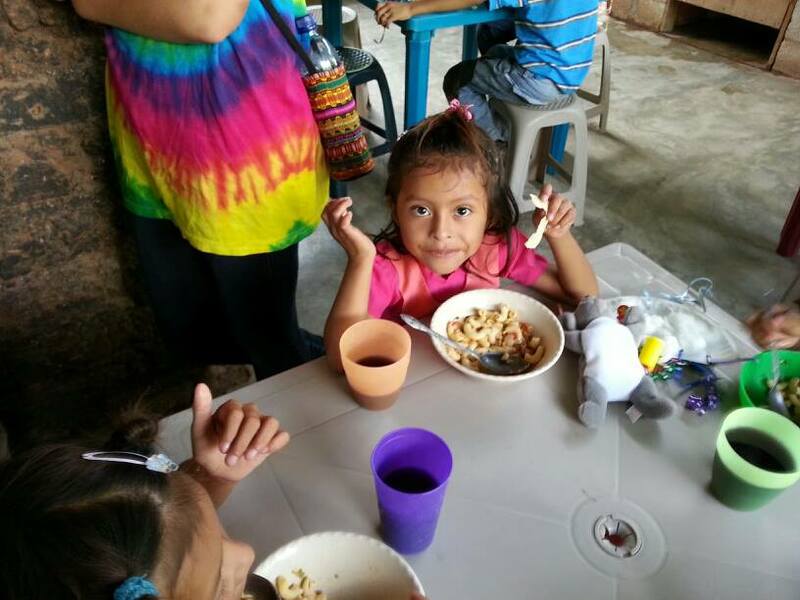 This entry was posted in Tithe Challenge and tagged Guatemala, hungry kids, Poverty, tithe. Bookmark the permalink.